TUGboat, Volume 37 (2016), No. 1. Vincent Lozano, Tout ce que vous avez toujours voulu savoir sur LaTeX sans jamais oser le demander. Ou comment utiliser LaTeX quand on n’y connaît goutte. Framasoft; 2013, 304pp, ill. Seconde édition. €15.00. ISBN 9791092674002. http://framabook.org/tout-sur-latex. This book, All You Always Wanted to Know about LaTeX but Never Dared to Ask, by Vincent Lozano, does well in both categories mentioned above. This book is in French and is divided into three parts. The book’s layout is nicely designed and clean. The author sprinkles in some humor throughout the book to make it an enjoyable read. The first part deals with introductory information concerning LaTeX. It starts off with the installation of LaTeX and goes on from there. One caveat: the installation information is most useful to those readers who are familiar with Unix. The rest of the first part tackles such things as creating documents, boxes, working with graphics and BibTeX, and given the francophone audience, the peculiarities of LaTeX documents in the French language. 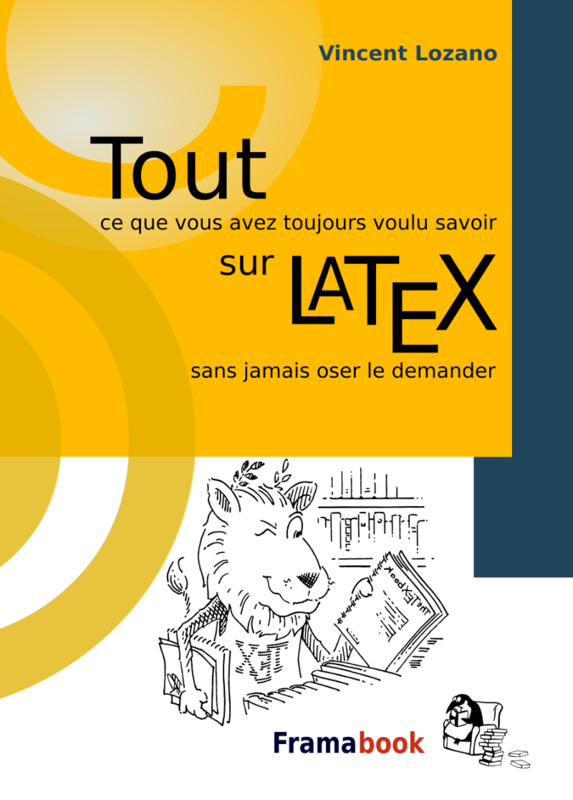 Though most of the information can be readily found in other introductory LaTeX books, for a French audience this is a very good starting point. The beginner is not inundated with so much information as to become overwhelmed. The author does a good job in striking the fine balance between “coolness” and usefulness for the beginner. The material that makes the book of great worth to many readers is in the second part of the book. This part walks the reader through the process of creating the book itself. This section deals entirely with customizing the look of LaTeX documents. I highly recommend going through the examples and following the explanations. It will be a beneficial exercise for the reader. The final part of the book contains appendices on generating pdfs and a listing of LaTeX symbols, which makes for a good reference. Throughout the book, the author gives ample suggestions about packages that would be of benefit to the readers. These suggestions will be of great value to readers, especially those new to LaTeX as it gives them a good starting point to delve even deeper into LaTeX and reap the full extent of the benefits LaTeX has to offer. I recommend this book and though it might not be of great value to an experienced LaTeX user, it is a good resource for the beginning and intermediate user. Given that it is in French, this book’s usefulness is amplified even more. The book is available under the Libre Art License, so anyone who wishes to can read and benefit from it. Finally, 10% of sales of the print edition are donated to TUG.